Fruit Remover contains three different gameplay modes: Normal, Original, and Challenge. In each mode, the basic goal is to remove all of the fruit from the game board. The gameplay unique to each mode is described below. 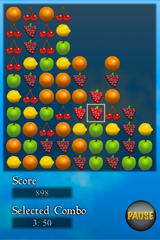 In normal mode, you progress from level to level by clearing the board without running out of single fruit to remove. After the first level, a singles limit counter is added to HUD. Each time you remove an individual fruit on it's own this counter will decrease. Once the counter reaches 0, you will no longer be able to reach future levels. After each level, more singles will be added to the amount you have left over for use in the subsequent levels. In original mode, only groups of fruit can be removed. 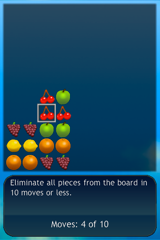 A level can be cleared if all fruit are removed from the board, but not all puzzles are solvable which makes this mode much more challenging. In challenge mode, each level provides a unique goal that will introduce players to different strategies of playing the game. To clear a level, the objective listed at the bottom of the screen must be met. Once all of the easy levels have been cleared, more challenging levels can be unlocked.